We would like to welcome you to our home which sits across from Historical Cotter. We sit on top of the bluff overlooking the amazing White River,which is Trout Capital USA, and The 1930 era Rainbow Bridge! During your stay we are available 24/7 to help you with any issues that might arise or questions you might have. The home is a 4 bedroom 2 bath with a detached covered garage. We have all the amenities of home including a 55” big screen smart TV with DishTV & Wifi & a DVD player with over 100 DVDs. There is a big game room in the garage with a Pool table, Foosball game table and Ping Pong table! We have a gas insert fireplace in between the living room & dining area. There are amazing views from the entire back of the home. You can literally see Missouri from here! The sun rises and the full moon are truly amazing! Not to take anything from the fog that forms in the early morning over the river. We have numerous bald eagles, golden eagles and hawks that soar at eye level at the back of the home over the river. It is so peaceful and quiet that you can literally hear the river below you. There is also an outdoor grilling area. For a great fishing trip or boat rentals go see Ms. Debbie at The Cotter Trout Dock. You can launch your boat at the free public boat ramp in Cotter which is only 1.8 miles which is right beside Big Springs Park that is a great local swimming spot. We have a huge front yard which has ample room to stretch your legs. We have a paved driveway with plenty of parking and room for your boats. We are surrounded by an abundance of wildlife. Just to name a few we’ve seen on the property are white tail deer, chipmunks, squirrels, red fox and raccoons. We catch ourselves sitting for hours just enjoying the nature that surrounds us listening to the river and the sounds of wildlife. We enjoy getting up early and having a cup of coffee in front of the fireplace looking over the fog on the river as the sun rises! It’s a great way to start your day. We are just 2 miles from historical Cotter which is a small historical town with a couple of cafes, great public fishing access, public park, boat launch, and Big Springs local swimming hole, trout guides, fly shop, and canoe and kayak outfitters. Flippin has a Walmart Supercenter and a couple of fast food places. Gassville has numerous fast food places, convenient stores, Mexican food and Bbq, burgers and pizza! Mountain Home, which is just a little farther from Gassville, has pretty much anything you could need or want in a little town, including great shopping and 2 movie theaters. Bull Shoals sits on the lake and has 2 huge marinas. It has 2 state parks with canoe rentals, hiking and fishing. Also in Bull Shoals are the Bull Shoals caverns. It has a couple of great cafes, bakeries, and a pizza place! It also has a couple of more upscale restaurants. Canoeing and kayaking on any of the many rivers in the area are breathtaking. Our favorites are the White River and the Buffalo River. There are plenty of trails for hiking, caves for spelunking, and antique shops everywhere. Family fun is just a short drive away through the beautiful Ozark Mountains to Branson which is just an 1½ hours from the home. There are year round shows, Zip lining, Silver Dollar City, & Branson Landing. There is also Mystic Caverns & Blanchard Springs Caverns just a short drive away & beautiful, historical Eureka Springs is only 88 miles away. 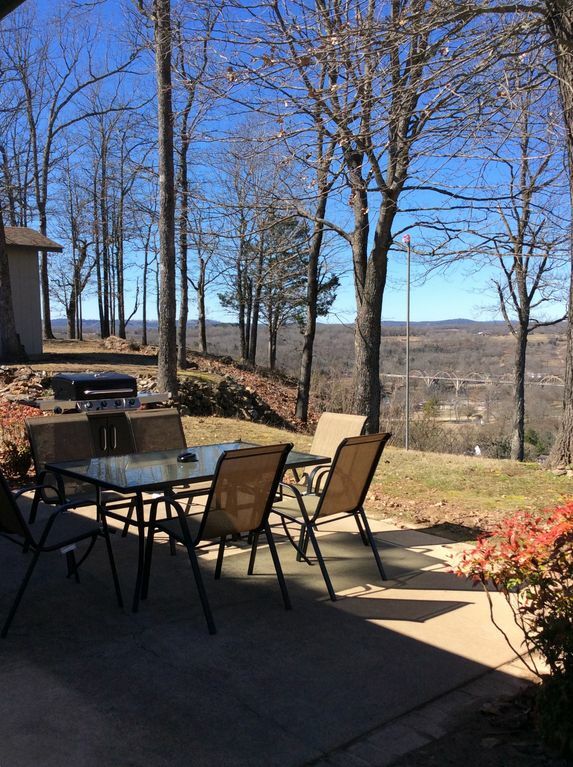 This house sits on a beautiful bluff that overlooks Historical Cotter! The Trout Capital USA! We are just a short drive over The 1930 era Rainbow Bridge to The Cotter Trout Dock for great fishing and Big Springs Park for fun swimming! Just a short drive to everything! White River in Cotter! Trout Capital USA! Overlooks the amazing White River in historical Cotter! The home has central heat & air. There is also a gas fireplace. Sleeper sofa in living room. Linen for sleeper is in the hall closet. DVDs are located in pantry closet next to refrigerator. 100+ DVDs! Really perfect with entire big family. We are so glad you and your family had such a great time! Perfectly place for granddad and three teenage boys! We are so glad y’all enjoyed your stay! The house was great. Beautiful view, very clean, kids loved the game room. We are so happy you and your kids had such a good time! The property has a lovely view over Cotter and the river. It's easy to access. Everything was clean, seemed recently renovated and didn't have clutter. Worked great and we are planning on renting the same cabin next year. I'd recommend it, for sure. We are so glad you enjoyed your stay at our cabin! Looking forward to seeing you next year!